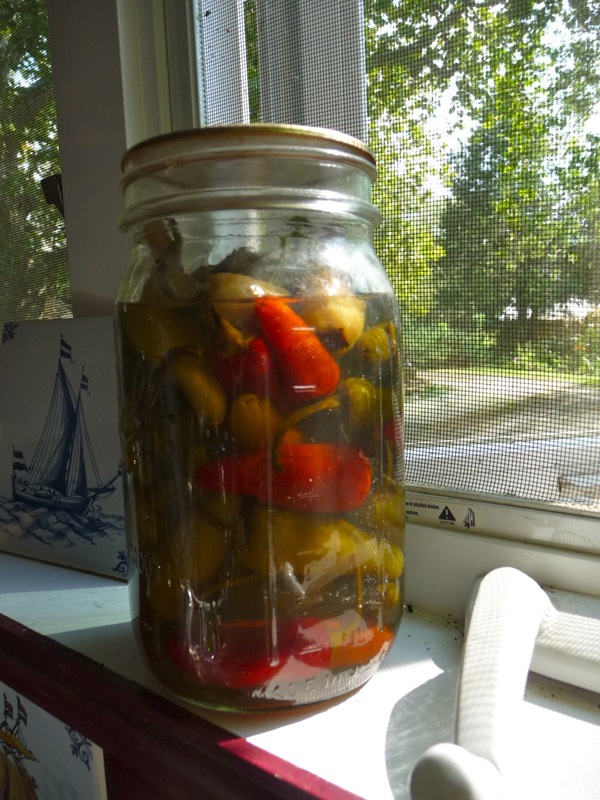 Fish peppers, reputed to be the favorite of Thomas Jefferson, one of our Founding Gardeners, are just about the right amount of hot for our tastes. I pickle them in cider vinegar and whenever I want a little heat but not too much in winter, I pull out a couple to put onto green salads, in tuna, quesadillas, whatever. They’re good fresh in fresh tomato salsa and gazpacho. I also put them in pineapple salsa, a recipe I adapted from Gourmet Cookbook, which suggests it as a companion to grilled jerk chicken. You can also substitute fresh mango or peach for the tinned pineapple. Mix all and let sit for an hour or overnight and serve with jerk chicken, fish tacos, grilled salmon….etc. Thank you for posting this! I'll definitely try it when my peppers ripen. Happy to. Good luck. You can also dry them – either in a dehydrator, or just string them in a dry place — a porch out of the sun or something like it. People used to say hang they, along with herbs, to dry in a closet, but I never found that satisfactory. Besides, they're so pretty to look at!